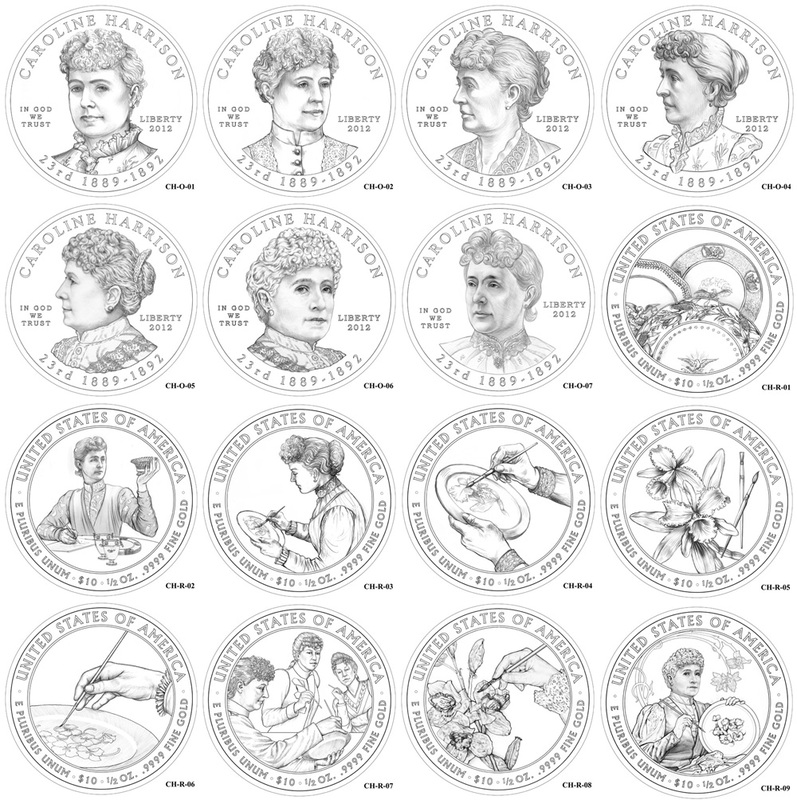 The Commission of Fine Arts (CFA) reviewed design candidates provided by the United States Mint for the 2012 First Spouse Gold Coins. 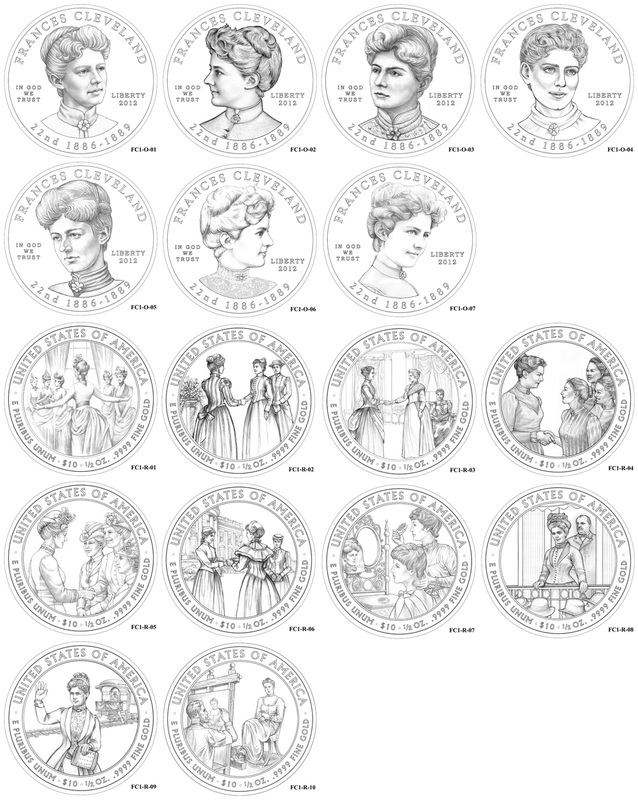 The coins feature Suffragist Alice Paul and the First Ladies Frances Cleveland and Caroline Harrison. This review took place at the same October 20, 2011 meeting that covered 2013 America the Beautiful Quarters designs. The First Spouse Gold Coin Program was authorized by Congress as part of the Presidential $1 Coin Act. One-half ounce 24 karat gold coins are issued for the spouse of each President. The year 2012 will mark the sixth year of release for the program and contains some differences from the usual format. Chester Arthur served in office without a spouse. 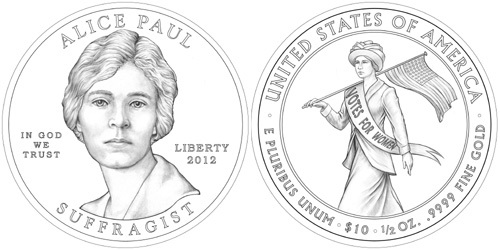 Alice Paul will be depicted on the coin representing his Presidency. Alice Paul is depicted on the first release of the year. She was a leading strategist in the suffragist movement, which ultimately resulted in the passage of the 19th Amendment, granting women the right vote. Her appearance within the series is specifically required under the Presidential $1 Coin Act, which mentions that she born during the Presidency of Chester Arthur. Other Presidents who served without a spouse (Thomas Jefferson, Andrew Jackson, Martin Van Buren, and James Buchanan) have been represented by depictions of Liberty taken from coins produced during the era of their Presidency. 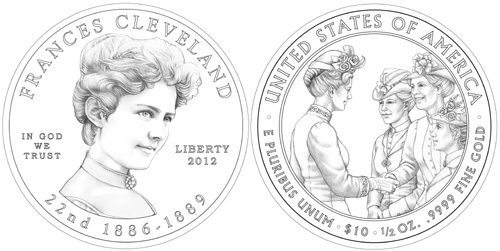 Frances Cleveland will appear on two separate First Spouse Coins released during 2012. This takes place because her husband Grover Cleveland served as President during two non-consecutive terms. This article will cover the design recommendations of the CFA. The design candidates will also be reviewed by the Citizens Coinage Advisory Committee before final selections are made by the Secretary of the Treasury. For the Alice Paul Gold Coin, the CFA remarked on the “poor quality and lack of a profile pose among the submitted alternatives” and commented that the hat and hair on many alternatives was “overly distracting from the face”. The reverse designs were criticized for “the prevalence of complicated compositions.” The two design candidates pictured above were their official recommendations. For the Caroline Harrison First Spouse Gold Coin, the Commission criticized the “generally grim character or facial expressions” of the alternatives, but selected the profile pose shown above. Their design for the reverse was selected “due to its interesting composition of circular forms.” Caroline Harrison is known for china-painting classes in the White House, which is represented in several candidates. 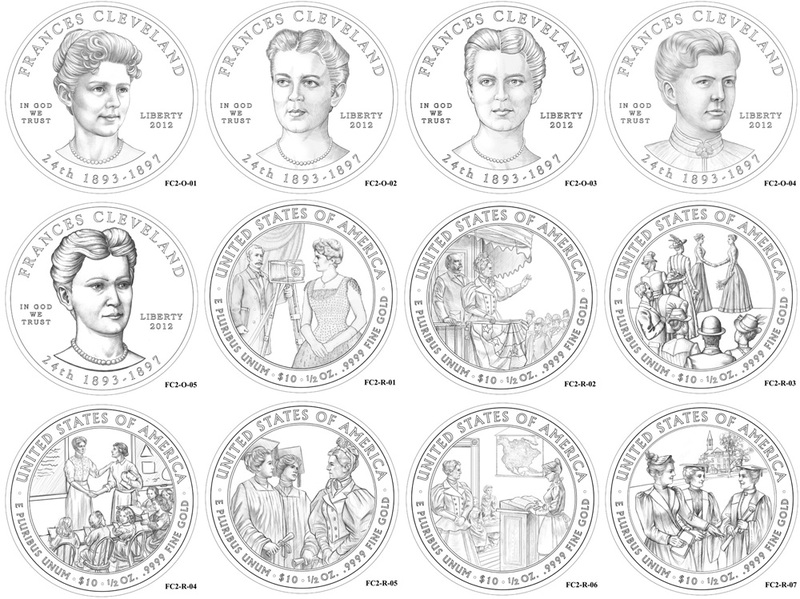 All of the obverse and reverse design candidates reviewed by the Commission of Fine Arts are shown below. Finally designs where the FS look pretty. The US Mint got it right this time. The flaw with the Alice Paul coin is that there is no mention of the “21st Presidency” and the years of that presidency. All of the other “non-spouse” coins have that information, making their place in the set obvious. Other than that, it’s not too bad. 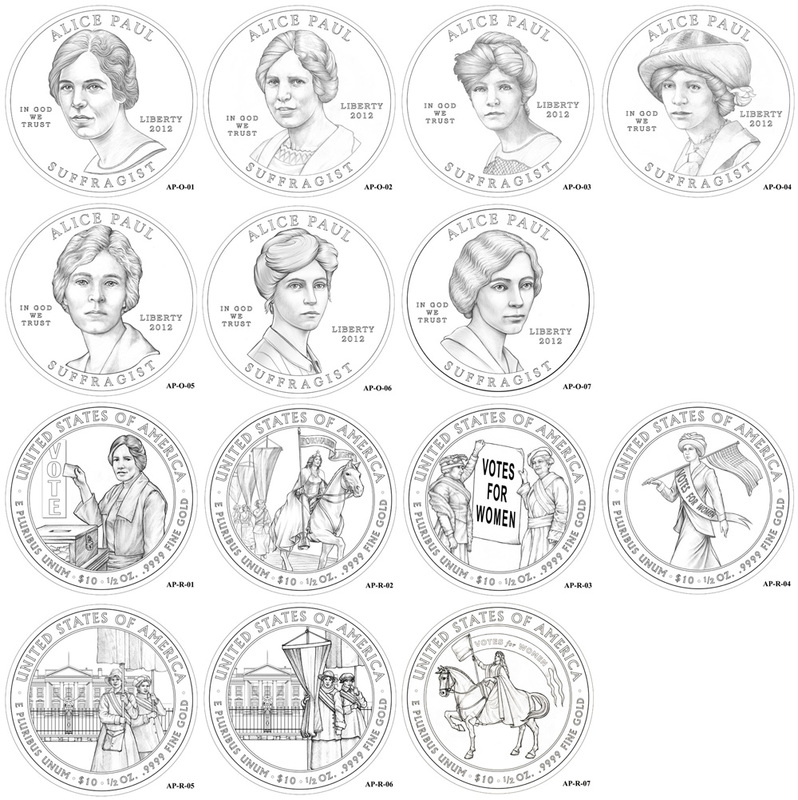 I’m a very disappointed that the program drifted away from the liberty theme for presidents without spouses when Alice Paul was chosen in place of another liberty coin. I would have loved to seen the Morgan Silver Dollar liberty resurrected on the gold coin and bronze medal to accompany the Chester Arthur dollar. Just my 2¢ worth. How about an expose on how in the first place Ms. Paul was placed on a coin, which few people will ever see, much less purchase, rather than as “paul” suggests a Morgan $, which would have been a massive seller and actually earned the Mint some coin. Inquiring minds want to know: Which imbecile in Congress got this PC feel good edict into law? Place your bets: Nancy Pelosi, Debbie Wasserman-Schultz, or perhaps Barbara Mikulski. The Presidential $1 Coin Act (Public Law 109-145) specifically requires the appearance of Alice Paul to represent the Presidency of Chester Arthur. According to Wikipedia, the Senate Bill which was eventually passed by the House and Senate and signed into law, was introduced by John Sununu. The very nice thing is that I won’t have to make a hundred phone calls to the mint to get one like the FUBAR 25th Anniversary ASE set. On even a 100 attempts on the internet. These puppies will run about $1,250 to $1,450 each and that will slow down sales a lot. P.S. these will be the KEY coins so far until 2013 when they will be the KEY coins. Key coins = very very very LOW mintage. 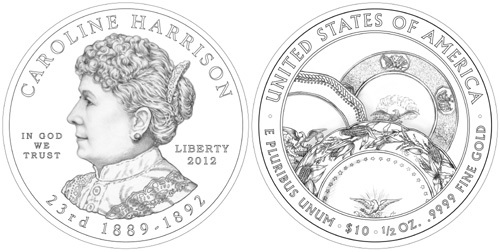 What’s funny about the Caroline Harrison coin is that the CFA made note of the “generally grim character or facial expressions” of the alternate designs for the obverse, so they voted for the design that exposed the least amount of her face. C’mon. There’s just too much politics and political tinkering with all this jack. What’s a suffragette got to do with the presidential spouse? Her appearance within the series was included in the legislation approved by Congress. The link to Chester Arthur is apparently the fact that she was born during his presidential term. …in the case of President Chester Alan Arthur, by a design incorporating the name and likeness of Alice Paul, a leading strategist in the suffrage movement, who was instrumental in gaining women the right to vote upon the adoption of the 19th amendment and thus the ability to participate in the election of future Presidents, and who was born on January 11, 1885, during the term of President Arthur.